Ohhhh, you remember playing "I spy"? I have been wondering around the internet (instead of doing my To-Do list!) this morning and have "spied" a customer using Clearly Digi Stamps on her project!! You never know when and where I will be "spying" and YOU just might be highlighted next!! 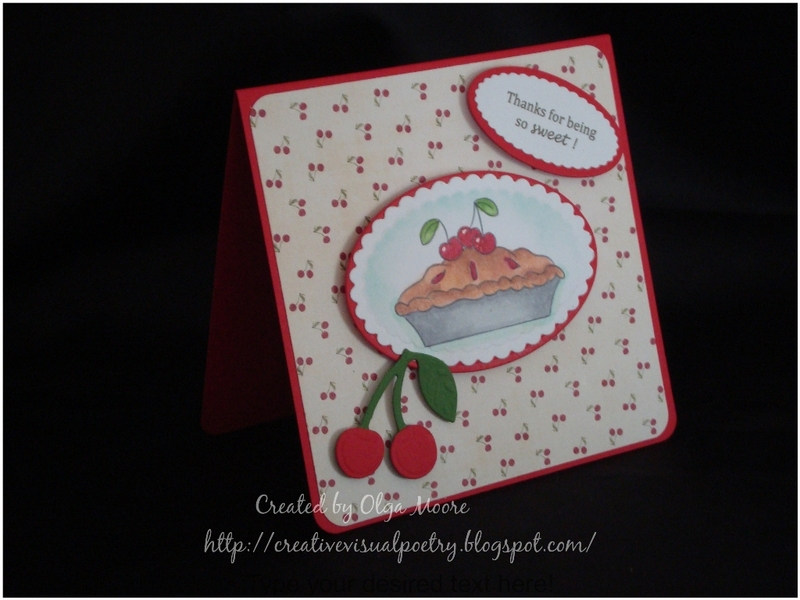 I wanted to thank you for choosing my card to spotlight on the ClearlyiStamp blog. I loved that CDS cherry pie image as soon as I saw it. It was perfect for my card project. And thanks for liking my card! Olga - your welcome! So glad I found your card. I have to check but I found paper like yours in the sale pile at my local scrapbook store...have to see if similar or same! Thanks for the inspiration! Olga first of all I love your name. Lol. My sister has the same one and it really is so unique. I wonder if your hair is red like hers as well. Lol. Your card here today is beautiful and I am so happy that Kathy saw it out there in the big paper crafting world. It deserves to be in the spotlight. Your a star sweetie. Hugs.